Buckland comprised a series of gold-mining settlements along the Buckland River in north-east Victoria. The settlements were spread over about 30 km of the Buckland Valley, the most northerly being Brookside, 8 km south-west of Bright. The river was named after Thomas Buckland, pastoralist, who occupied a pastoral station near the headwaters of the Buckland and Ovens Rivers in 1845. The Buckland River rises near Mount Selwyn, enters a valley which skirts the eastern edge of the Mount Buffalo plateau and enters the Ovens River just west of Porepunkah. Gold was discovered in the Buckland Valley in 1853 but it was not intensively worked until later in the decade. Many Chinese miners came to Buckland, outnumbering Europeans by about three to one. In 1857 several European miners, racially prejudiced and resentful of the Chinese miners' success, raided and destroyed several Chinese camps. Their violence led to trials culminating in watered down verdicts and to legislation that was nugatory in protecting the Chinese from further outrages. By 1860 the mining settlements were sufficiently established for Catholic and Presbyterian schools to be opened. By 1876 there was a string of settlements, from Miner's Right, upstream of upper Buckland, to Brookside. 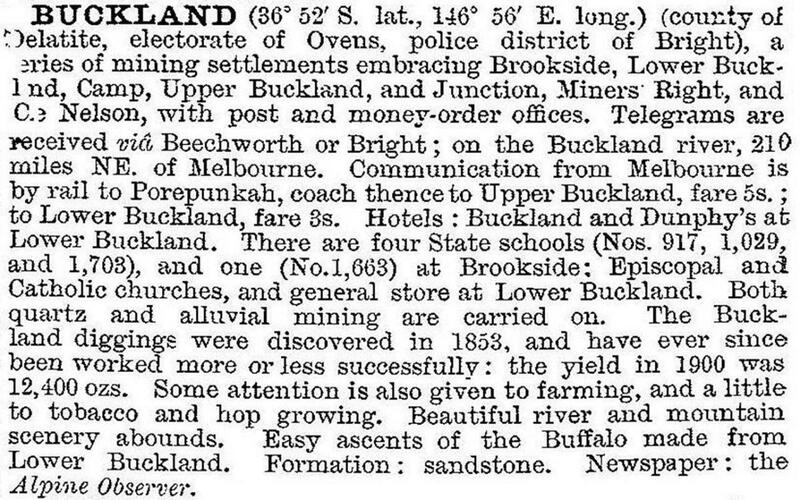 In 1865 Bailliere's Victorian gazetteer recorded the Buckland Camp as having a police station, a court, a post office, a large public hall and a hotel. The locality was described as extremely picturesque and very healthy, with considerable pasture land. The compiler thought that the surrounding country resembled somewhat the Sierra country of Spain. Lower Buckland had alluvial mining and Upper Buckland had reef gold. Local government was in the form of the Buckland district road board (1862) which was incorporated in Bright Shire in 1866. At the last recorded census for Buckland (2006) accommodation accounted for 22% of employment and farming 15.2%.